There are many reasons why your shoulder may be weak. It may be the result of a rotator cuff tear, or it could also be caused by a neck injury that compresses (pinches) a nerve. 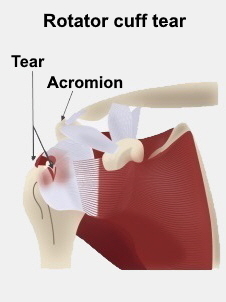 Most rotator cuff tears happen gradually, because of long-term wear and degeneration of your shoulder tendons. Often they don't cause any symptoms. They generally happen to people who have done lots of overhead activities, or used their arms a lot in their work. Sometimes these tears can become painful for no apparent reason, but the pain will often get better with time and treatment. Some medical conditions, such as heart disease and some metabolic disorders, as well as poor nutrition and smoking can weaken your tendons, making it more likely you will get a rotator cuff tear. You may have rotator cuff tears if it becomes more difficult than usual to lift your arm outwards or forwards, you feel like you need to help your arm with the other arm, your shoulder hurts at night, and your arm becomes weaker than normal. However, sometimes the pain comes on suddenly, or after a traumatic event, like falling on your shoulder, lifting a heavy object, or falling onto your outstretched hand. A forceful overhead movement (common in tennis) can also be to blame. When this happens it is called an acute tear. (Acute means something that happened recently and came on quickly.) You may have pain that goes down into the top of your arm. Your arm may also feel heavy and you won't be able to move it much. Who can help to treat a rotator cuff tear? If you suspect you have a torn rotator cuff it is important to see your GP or a physiotherapist. You may need an ultrasound scan to see where the injury is. If you have a significant rotator cuff tear your doctor or physiotherapist may refer you to see an orthopaedic specialist, who will decide how to manage your injury. If your injury was caused by an accident, treatment may be covered by ACC. However, if it is caused by a gradual or age-related process, your doctor may refer you to a publicly funded shoulder clinic. You may also choose to see a private orthopaedic surgeon or a physiotherapist who specialises in shoulder injuries. Some exercises can help with weak shoulders and rotator cuff tears. They include shoulder adduction and abduction, flexion and extension, and resisting rotation, inwards and outwards.